The power of any kind of network approach lies in its ability to simplify a complex system so as to better understand its function as a whole. Sometimes it is beneficial, however, to include more information than is available in a simple graph of nodes and links. 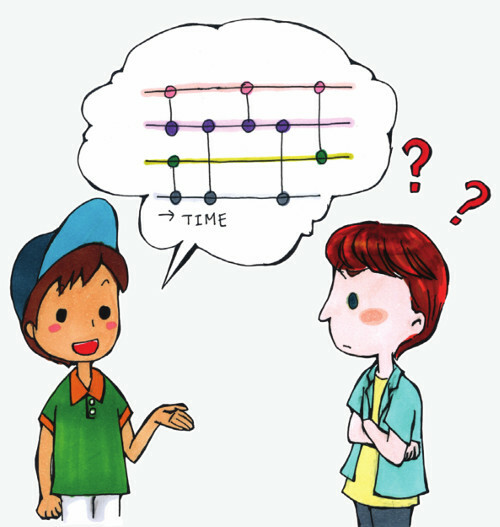 Adding information related to the timing of interactions can facilitate more accurate predictions, as well as a deeper mechanistic understanding. Effect of the simulated deformation of a physical feature (the local density of state) of an optical lattice analogue of graphene in curved space. The single-carbon-atom-thick material, graphene, featuring ripples is not easy to understand. Instead of creating such ripples physically, physicists investigating this kind of unusually shaped material rely on a quantum simulator. It is made up of an artificial lattice of light - called ultra-cold optical lattice - akin to eggs held in the cavities of an egg tray. This approach allowed a team of theoretical physicists from India to shed some light - literally and figuratively - on the properties of rippled graphene. These findings have just been published in EPJ B by Tridev Mishra and colleagues from the Birla Institute of Technology and Science, in Pilani, India. Ultimately, this work could find applications in novel graphene-based sensors. Redeposition on hexagonally arranged dots. Nanoscale worlds sometimes resemble macroscale roller-coaster style hills, placed at the tip of a series of hexagons. Surprisingly, these nanohills stem from the self-organisation of particles – the very particles that have been eroded and subsequently redeposited following the bombardment of semi-conductors with ion beams. Now, a new theoretical study constitutes the first exhaustive investigation of the redeposition effect on the evolution of the roughening and smoothing of two-dimensional surfaces bombarded by multiple ions. The results demonstrate that the redeposition can indeed act as stabilising factor during the creation of the hexagonally arranged dot patterns observed in experiments. These findings by Christian Diddens from the Eindhoven University of Technology, in the Netherlands, and Stefan Linz, from Munster University, Germany, have been published in a study published in EPJ B. Heat conductance as the function of temperature T for different lattice size N = 50; 100; 200; 400; 800 and 1600. How heat travels, matters. Yet, there is still no consensus on the exact physical mechanism that causes anomalous heat conduction - despite the existence of previous numerical simulation, theoretical predictions and experimental observations. Now, a team based in Asia has demonstrated that electron transport depends on temperature. It follows a scaling governed by a power law - and not the exponential scaling previously envisaged. These findings were recently published in EPJ B by Yunyun Li Tongji University, Shanghai, China, and colleagues in Singapore. Close-up view of a martensitic transformation from the Fe1-xNix crystallites in a large system at 348 K.
Iron-nickel alloys are ubiquitous: they are found at the earth’s core and in meteorites. What is fascinating about such alloys is that their inner structure can change with rapid temperature swings. Heated up above 730 °C (1,340 °F), these alloys enter what is referred to as an austenitic phase. Alternatively, they can be turned into very hard alloys, referred to as a martensitic phase, by subjecting them to extremely rapid cooling. Now a team of scientists from Germany has, for the first time, created a large-scale simulation involving 275,000 atoms representing iron-nickel alloys in proportions found in nature. They show that transitions from one alloy structure to the other occurs in both an orderly and a disorderly way, depending on whether it is heated up or cooled down, respectively. These findings have been published in EPJ B by Emilia Sak-Saracino and Herbert Urbassek from the Research Center OPTIMAS at the University of Kaiserslautern, in Germany. 'Big Data' from electronic records derived from mobile telephone calls enables the study human behaviour and sociality in a quantitative way and with unprecedented statistical power. Cell phones are ubiquitous and Call Detail Records (CDRs), automatically collected by telecom operators are records of verified, time-stamped one-to-one communication. They are particularly useful to understand one-to-one communication patterns, as well as the dynamics of the social networks that are reflected in such patterns. In this EPJ B Colloquium, Jari Saramäki and Esteban Moro present an overview of empirical results pertaining to the multi-scale nature of social dynamics and networks, as inferred from CDRs. Graphics Processing Units (GPU) are currently used as a cost-effective platform for computer simulations and big-data processing. Large scale applications require that multiple GPUs work together, but the efficiency obtained with cluster of GPUs is, at times, suboptimal because the GPU features are not exploited at their best. Analytical techniques, originally developed for traditional materials, turn out to be very useful to study the composition and structure of artistic and historical specimens. But the reverse is also true. The study of ancient artefacts is providing interesting insights of more general interest to materials scientists, as well as inspiration for current artists. Networks of networks, or multilayer networks, are a fitting description of social systems. Small and seemingly irrelevant changes in a network can have catastrophic consequences in another network. Moreover the structures of networks are relevant to the evolution of cooperation. In this EPJ B colloquium, devoted to evolutionary games on multilayer networks, Zhen Wang and colleagues take into consideration the implications of the fact that humans are usually members of multiple social networks and conclude that the evolution of cooperation is one of the main pillars of modern human societies. The dependence on the efficiency and the power on the gate voltage. Just as alchemists always dreamed of turning common metal into gold, their 19th century physicist counterparts dreamed of efficiently turning heat into electricity, a field called thermoelectrics. Such scientists had long known that in conducting materials the flow of energy in the form of heat is accompanied by a flow of electrons. What they did not know at the time is that it takes nanometric-scale systems for the flow of charge and heat to reach a level of efficiency that cannot be achieved with larger scale systems. Now, in a paper published in EPJ B Barbara Szukiewicz and Karol Wysokiński from Marie Curie-Skłodowska University, in Lublin, Poland have demonstrated the importance of thermoelectric effects, which are not easily modelled, in nanostructures.